Hyde Park, London, England - - 1900, Watercolor. Signed HL in pencil, lower right. Signed, dated and titled in pencil, in the bottom left margin. Image size 9 1/2 x 13 3/8 inches (241 x 340 mm); sheet size 10 x 14 1/4 inches (254 x 362 mm). A fine spontaneous work, with fresh colors, on buff wove drawing paper, with margins (1/4 to 1/2 inch). A professionally repaired tear (not visible recto) in the lower left sheet edge, extending 1/2 inch into the image, otherwise in excellent condition. In the original gallery mat. 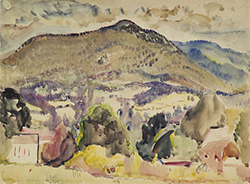 Provenance: Estate of Leonard Clayton, gallery owner representing Lever and supporter of the artist in his later years. The Cockle Gatherers, Exmouth, England - - 1904, Watercolor. 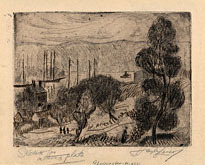 Signed and titled in pencil, lower right. 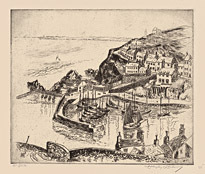 Titled in pencil Cockle Gathers, Exmouth, Devon, Eng., verso. Image size 9 3/8 x 13 3/8 inches (238 x 340 mm); sheet size 10 x 14 inches (254 x 356 mm). 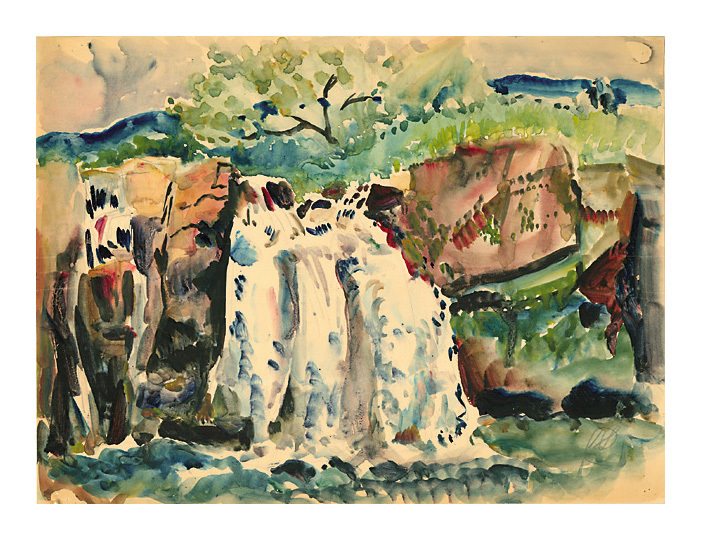 A fine spontaneous work, with fresh colors, on cream watercolor paper; with 1/4 inch margins, in excellent condition. In the original gallery mat. 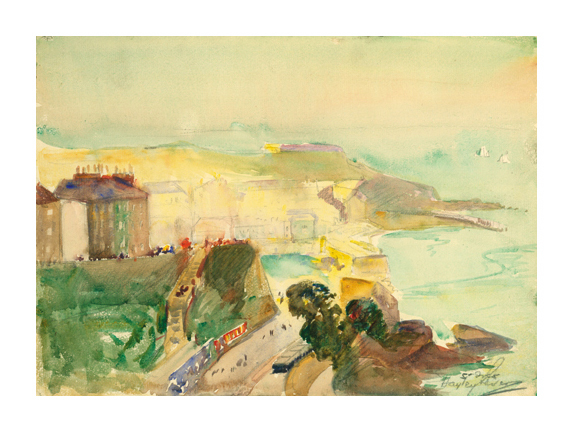 St. Ives, Cornwall, England - - 1904, Watercolor. 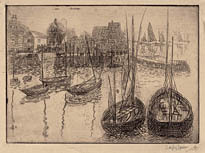 Signed and titled St. Ives, lower right. Image size 10 x 14 inches (254 x 356 mm). A fine spontaneous work, with fresh colors, on cream watercolor paper; the image extending to the sheet edges, in excellent condition. In the original gallery mat. 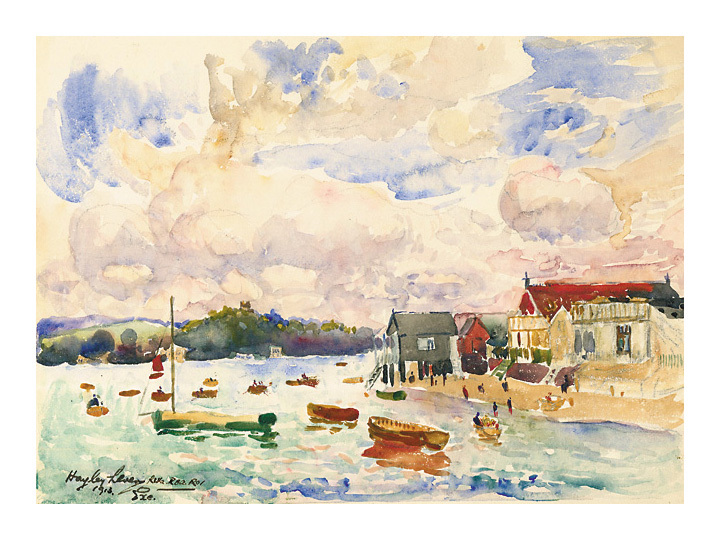 St. Ives Harbor, Cornwall, England - - 1905, Watercolor. Signed and titled in ink, lower right. Image size 10 1/4 x 14 1/4 inches (260 x 362 mm). A fine spontaneous work, with fresh colors, the image extending to the sheet edges; in excellent condition. In the original gallery mat. 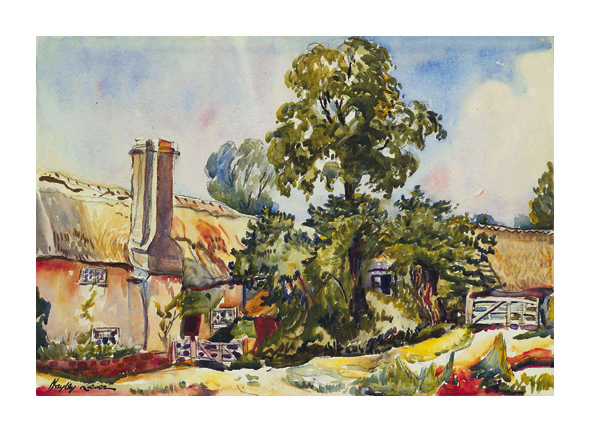 Farmhouse, Devonshire, England - - 1906, Watercolor. Signed in watercolor, lower left. Titled in pencil, verso. Image size 9 3/8 x 13 1/2 inches (238 x 343 mm). 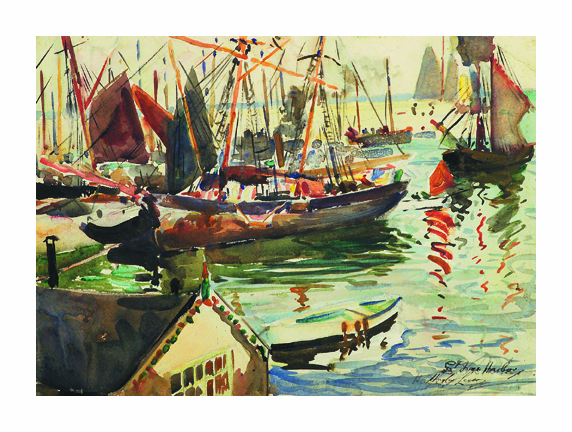 A fine spontaneous work, with strong, fresh colors, on off-white watercolor paper; the image extending to the sheet edges, in excellent condition. In the original gallery mat. 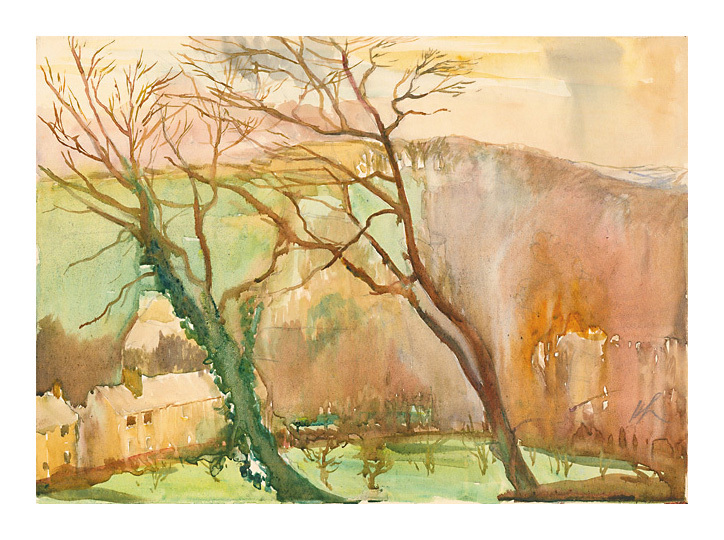 St. Astruell, England - - 1910, Watercolor. Image size 9 1/2 x 13 1/2 inches (241 x 343 mm); sheet size 10 1/8 x 14 1/4 inches (257 x 362 mm). A fine spontaneous work, with fresh colors, on cream wove paper; with margins (1/4 to 3/8 inch), in excellent condition. In the original gallery mat. 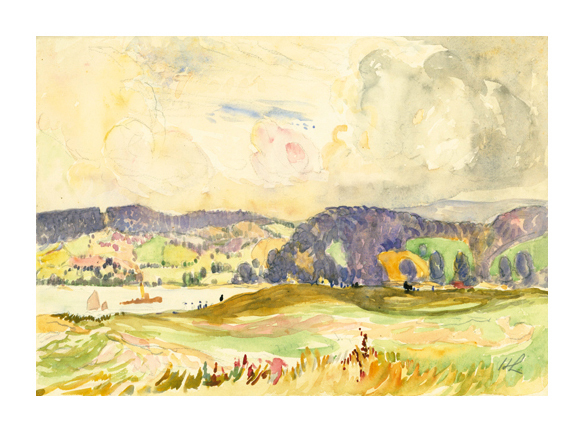 Exe River and Landscape, Devon, England - - 1910, Watercolor. Signed HL in pencil, lower right. Image size 9 1/2 x 13 1/2 inches (241 x 343 mm); sheet size 10 x 14 1/4 inches (254 x 362 mm). 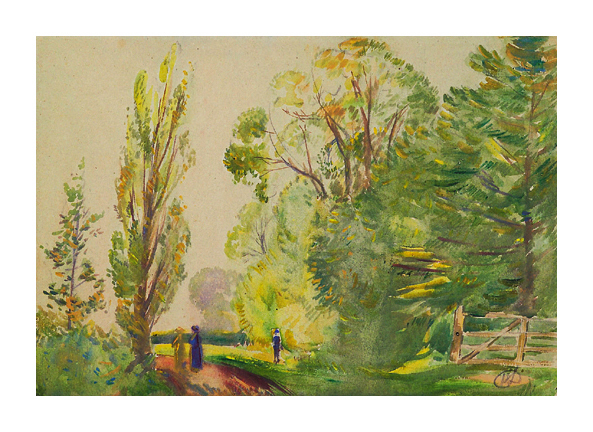 A fine spontaneous work, with fresh colors, on off-white watercolor paper; with margins (1/4 to 3/8 inch), in excellent condition. In the original gallery mat. 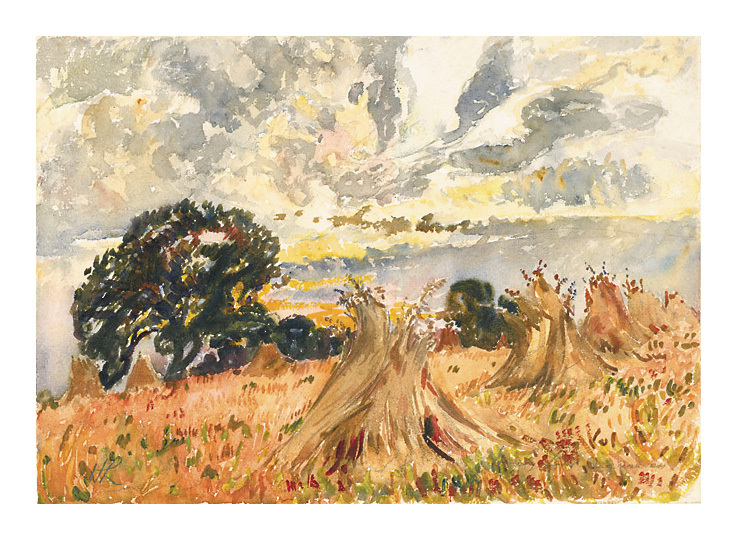 Haystacks, Exmouth - Devon, England- - 1911, Watercolor. Signed in pencil, lower right. Initialed in pencil, lower left. Image size 9 1/2 x 13 1/2 inches (241 x 343 mm); sheet size 10 1/8 x 14 3/8 inches (257 x 365 mm). A fine, spontaneous work, on cream wove watercolor paper, with margins (1/4 to 1/2 inch). Hinge tape remains on the top sheet edge, well away from the image; otherwise in excellent condition. In the original gallery mat. 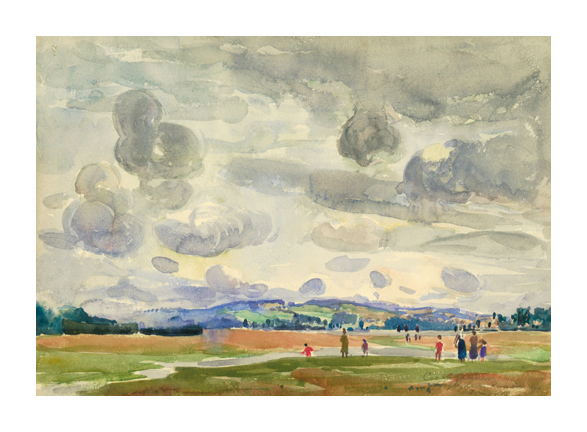 River Exe, Exmouth, England- - 1913, Watercolor. Signed, dated and titled in ink, lower left. Image size 9 1/2 x 13 1/2 inches (241 x 343 mm); sheet size 10 3/4 x 14 7/8 inches (273 x 378 mm). A fine spontaneous work, with fresh colors, on cream wove paper, with full margins (1/4 to 3/4 inch); rippling along the bottom sheet edge, not affecting image; otherwise in excellent condition. In the original gallery mat. 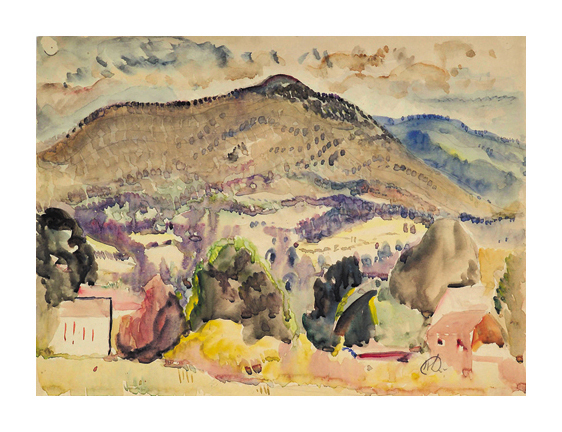 Woodstock, New York - - 1922, Watercolor and Pencil. Signed HL and dated in pencil, lower right. Titled and dated in pencil, verso. Image size 11 x 15 inches (279 x 381 mm). A fine spontaneous work, with fresh colors, on cream wove paper, the image extending to the sheet edges. Minor creasing at the sheet edges, a 1/4 inch repaired tear in the bottom left sheet edge, otherwise in excellent condition. 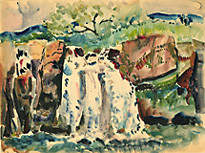 Water Fall, Bronx River - - 1938, Watercolor. A fine spontaneous work, with fresh colors, on cream wove paper, with the image extending to the sheet edges; the artist’s original tack holes in the four sheet corners, otherwise in excellent condition. In the original gallery mat. Gloucester, Mass. - - 1914, Pencil and Ink. Image size 6 x 10 7/8 inches (152 x 276 mm). 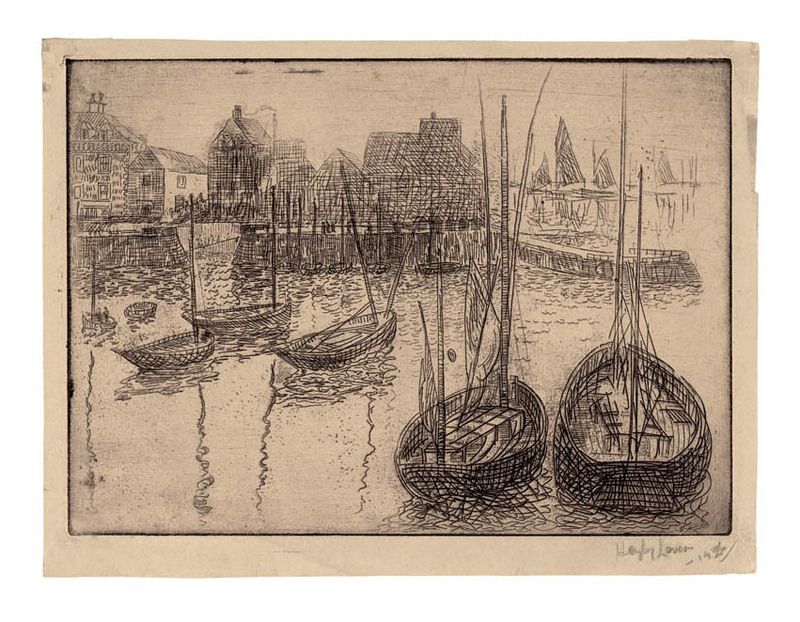 A fine spontaneous work, on tan wove paper, with the image extending to the sheet edges, in excellent condition. 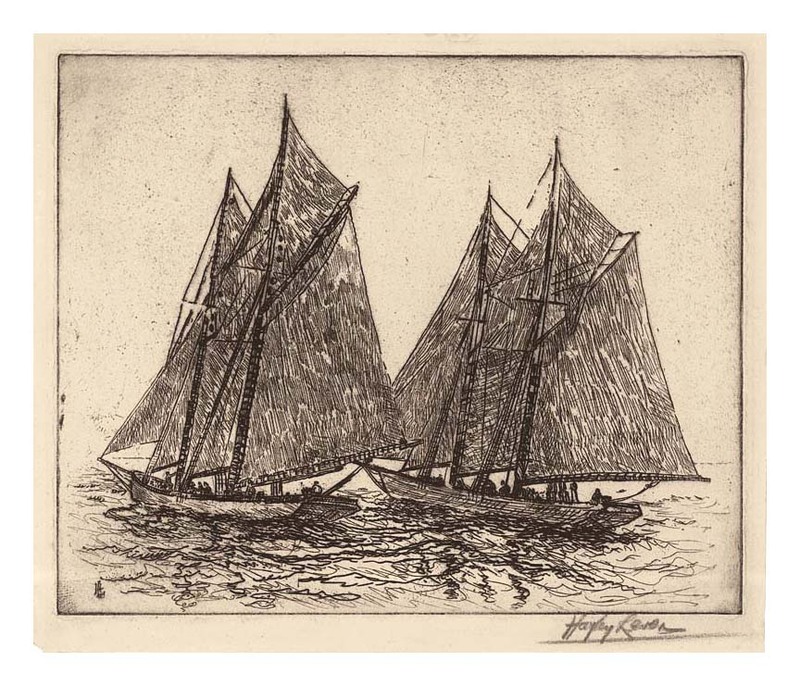 Flying Sails - - c.1908, Etching. Edition 25. Signed in pencil. Image size 4 7/16 x 6 inches (113 x 152 mm); sheet size 5 3/16 x 6 7/8 inches (132 x 175 mm). A fine impression, on buff wove paper, with margins (3/16 to 1/2 inch), in excellent condition. Ex. 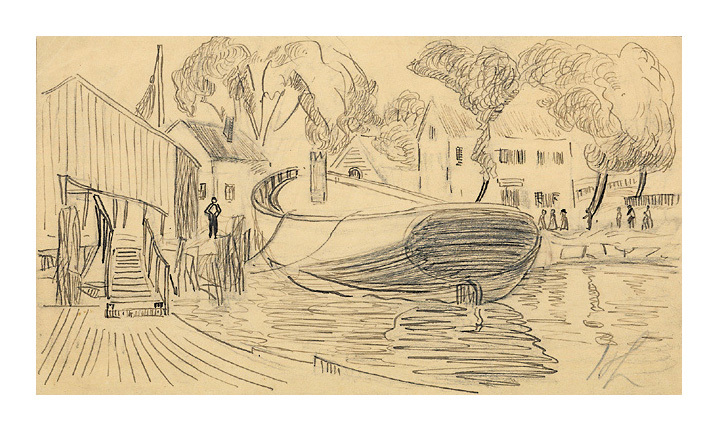 collection Clayton-Liberatore Gallery, Bridgehampton, New York. 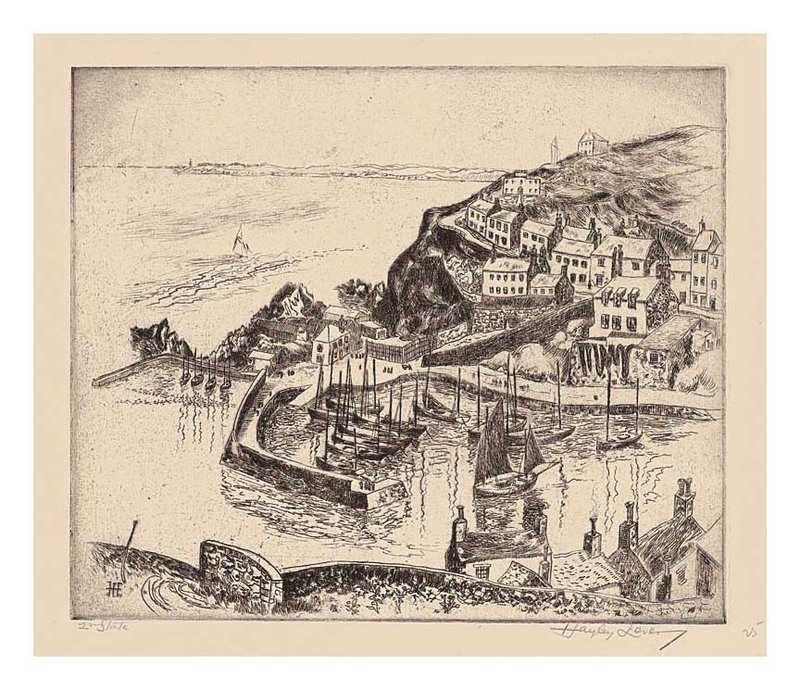 Mevigassey, Cornwall, England- - c.1908, Etching. Edition 25. Signed in pencil; titled, verso. Signed in the plate, lower left. Image size 10 x 11 7/8 inches (254 x 302 mm); sheet size 11 1/4 x 15 inches (286 x 381 mm). A fine impression, on cream wove paper, with full margins (5/8 to 1 5/8 inch), in excellent condition. 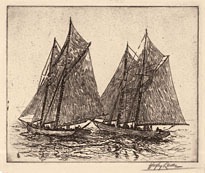 The Race - - c.1908, Etching. Edition not stated. Signed in pencil. Initialed in the plate, lower left. Image size 7 15/16 x 9 7/8 inches (202 x 251 mm); sheet size 8 15/16 x 10 5/8 inches (227 x 270 mm). A fine impression, on cream wove paper, with margins (3/8 to 5/8 inch), in excellent condition. Edition 5. Signed and dated in pencil. 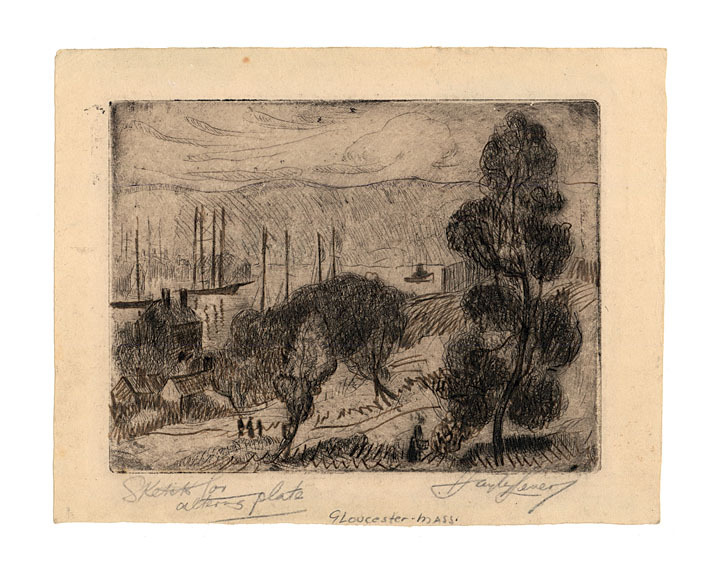 Titled and annotated Edition 5 and Plate #44 in pencil, verso. Image size 7 x 9 3/4 inches (178 x 248 mm); sheet size 7 3/4 x 10 1/2 inches (197 x 267 mm). A fine impression, on buff/grey wove paper, with margins (1/4 to 1/2 inch), in excellent condition. 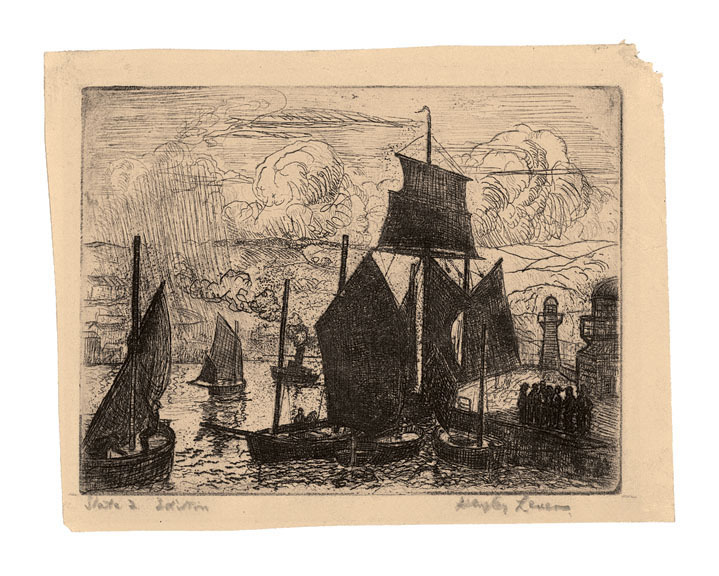 Provenance: Clayton-Liberatore Art Gallery, with the gallery collection stamp verso. 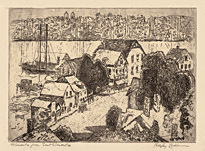 Gloucester, Mass.- - c.1926, Etching and Sepia Ink. Edition artist's proof. Signed and annotated Sketch for altering plate in pencil. Image size 4 7/16 x 5 15/16 inches (113 x 150 mm); sheet size 5 5/8 x 7 3/8 inches (143 x 187 mm). 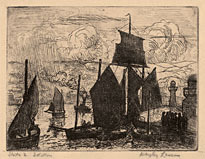 A fine impression, with extensive additions in sepia ink by the artist, on buff wove paper, with margins (5/8 to 3/4 inch), in excellent condition. 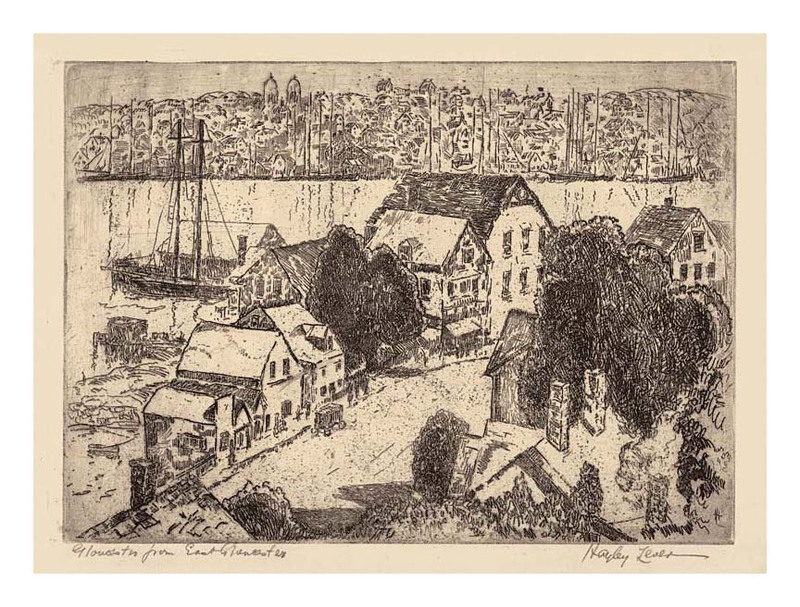 Gloucester from East Gloucester- - c.1926, Etching. Edition 10. Signed and titled in pencil. Initialed in the plate, lower right. Image size 7 x 9 3/4 inches (178 x 248 mm); sheet size 8 5/8 x 11 3/4 inches (219 x 298 mm). A fine impression, on cream wove paper, with margins (5/8 to 1 inch), in excellent condition.